Rosa Maria Malet, Director of the Fundació Joan Miró, and Elisa Durán, General Director of ”la Caixa” Foundation, introduced French-Algerian artist Kader Attia as the new Joan Miró Prize winner. Mr. Attia was unanimously selected by an international jury composed of Iwona Blazwick, director of Whitechapel Gallery (London), Magnus af Petersens, director of Bonniers Konsthall (Stockholm), Alfred Pacquement, former director of the Musée National d’Art Moderne, Centre Georges Pompidou (Paris), Nimfa Bisbe, Head of the ”la Caixa” Foundation contemporary art collection, and Rosa Maria Malet, Director of Fundació Joan Miró (Barcelona). The jury members, all acclaimed professionals in the field of modern and contemporary art, chose among a pool of possible candidates with outstanding, innovative careers based on creative freedom akin to the work and spirit of Joan Miró. In their statement, the jury members lauded “Attia’s passionate engagement with current affairs and with the shared fate of humanity [which] has close links to Joan Miró’s involvement in the critical episodes that marked his generation, while Attia’s unique take on complex, often traumatic, human relationships across cultures resonates with Miró’s universal aspirations.” The jury also highlighted the breadth of his artistic research, especially with regard to the lingering effects of colonialism, as well as his encyclopedic, yet nuanced elaboration of the notion of repair. As the winner of the Premi Joan Miró, Attia will receive a EUR 70,000 cash prize, and will be given the opportunity to present a solo exhibition at Fundació Joan Miró in 2018. The artist will also be presented with a solid-titanium trophy, an original design by André Ricard. In addition, Attia’s wide range of interests has frequently led him to turn to other disciplines, such as medicine, physics, philosophy, psychoanalysis, and architecture. Attia studied at the École Supérieure des Arts Appliqués Duperré and the École Nationale Supérieure des Arts Décoratifs, in Paris, and Escola Massana, Centre d’Art i Disseny, in Barcelona. His work has been featured at leading international institutions such as The Whitechapel Gallery (London), Tate Modern (London), Centre Pompidou (Paris), MoMA (New York), the Solomon R. Guggenheim Museum (New York), the Museum of Contemporary Art Australia (Sydney), the KW Institute for Contemporary Art (Berlin), and the Museum für Moderne Kunst (Frankfurt), among others. He has also participated in multiple biennials, including the 11th Cairo Biennial; the 5th and 6th Marrakech Biennials; and the 50th and 57th editions of the Venice Biennale. In addition to the Joan Miró Prize, he has also received the 2008 Biennial Prize from the Cairo Biennial, the 2010 Abraaj Capital Art Prize, and the 2016 Marcel Duchamp Prize. 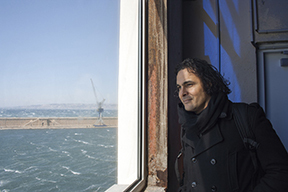 Kader Attia currently divides his time between Berlin and Algiers, and is fully engaged in the programming of La Colonie, a space of cultural and artistic exchange in Paris. 2017 marks the sixth edition of the Joan Miró Prize, which is awarded every two years. Previous winners of the Prize were Olafur Eliasson (2007), Pipilotti Rist (2009), Mona Hatoum (2011), Roni Horn (2013), and Ignasi Aballí (2015).